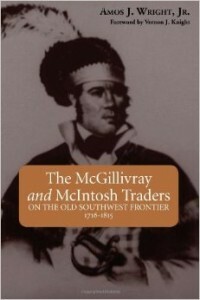 The McGillivray and McIntosh Traders: On the Old Southwest Frontier, 1716-1815, Amos J. Wright, NewSouth, Inc.
Don’t buy this book for the storytelling. Quite honestly, The MacGillivray and McIntosh Traders could have used an editor: the narrative tends to wander and I found myself re-reading paragraphs to make sure that I was getting it all straight. But, the research: black gold; Texas tea. Serious students of the Creeks of the late 18th century and family researchers of the early Mississippi Territory must have this volume in the library. Buy it for the genealogy alone. The families here are the subject of many tales that have grown in the telling. Wright, however, tackles the received canon and gives us a well-documented look at many of the people who left an indelible mark on the southeast during the revolutionary period. The traders in mind are the Scot, Lachlan Lia McGillivray (1719-1799) and his Creek son, Alexander (1750-1793). Lachlan made his fortune in the American leather trade. Like many of the backcountry pelt barons, he secured his bona fides with his Creek suppliers by marrying into the influential Wind clan. Alexander, in turn, became his father’s apprentice and eventually leveraged his association with the trading firm of Panton, Leslie into a position of personal power and wealth. Alexander’s nephew, William Weatherford (c. 1782-1824), would figure prominently when war broke out on the frontier in 1813. One example of Wright’s deconstruction of the canon is the paternity of David Tate (1778-1828). Tate was also one of Alexander’s nephews, but significantly the one who inherited his estate. This made David a rich man but, as a consequence, a lighting rod for the traditionalist Creeks. Tate’s father has traditionally been identified as Col. John Tate, a British officer who died near Cusseta (a Lower Creek town near present-day Columbus, Georgia) while leading a war party during the American Revolution. John Tate was the father of Davy Tate, and was the last agent the English Government ever had among the Creeks. During the American revolution, Tate raised a large number of Indians on the waters of Alabama, and from almost every town (except the Tallassees and Netchez, who, through the influence of McQueen, never did take up arms against the colonies during the revolution.) Tate carried his warriors to Chattahoochee, and there joined Tusta Nuggy Hopoy, or Little Prince, with the Chattahoochee Indians, and started to Augusta, Ga., to aid a Col. Griefson, better known as Grayson, a Tory Colonel. Near the head springs of the Upatoy creek, and near old Fort Perry, Tate became deranged; the cause I never learned. He was brought back to old Cusscraw and died; he was buried on a high hill east of the old town, and near what was the residence of Gen. Woolfolk when I left the country. I have been shown his grave often, and have heard what I have stated from Little Prince, and a hundred others that were along at the time. The story had currency within the family. Tate’s son-in-law, J. D. Driesbach, repeated the substance of it in a letter to Lyman Draper in 1874. Tate’s grandson, Elisha Tarvin, repeated it in 1893. The tale made its way onto the Kashita Town monument at Fort Benning and then into such recent works as Benjamin W. Griffith’s, McIntosh and Weatherford: Creek Indian Leaders (Tuscaloosa: University of Alabama, 1988). Wright could never find any record commissioning a Colonel John Tate, however. What did exist was an uncanny parallel with events in the life of Capt. David Taitt, a surveyor, cartographer and deputy to British Indian Superintendent, John Stuart. Taitt was a confidante of Alexander McGillivray and was frequently present at Little Tallasee between 1772 and 1781. Taitt also led an aborted Indian raid into east Georgia. The departure was his survival of the war. Parenthetically, this is par for Woodward: in another instance of receiving alleged first-hand knowledge, he passed along questionable details about the maternity of Dr. Thomas Holmes (the survivor of Ft. Mims and one of A. J. Pickett’s informants for The History of Alabama and Incidentally of Georgia and Mississippi). Here we must question Wright. He ultimately dismisses Taitt as David’s father on circumstantial grounds: chiefly, Taitt was in bad odor in the Upper Nation by 1778, making him an unlikely paramour for McGillvray’s sister, Sehoy. Further, he argues that Sehoy would have never married Charles Weatherford while Taitt was still in the country. This, unfortunately, fails the test for circumstantial evidence. As mentioned, Taitt raised a force of Upper Creeks for the relief of Savannah in 1779, a remarkable accomplishment for a man without influence in the nation. Spanish Governor Galvez also threatened his execution in 1780 because of his influence with the Indians. But 1779 was also Taitt’s annus horribilus. He lost his protege, Superintendent John Stuart, in February. In March, the war party that he financed out of his own pocket was scattered. His mission failed, his hopes for advancement dashed, he made his way into the British lines at Savannah. And as I’ve hinted, things did not improve in 1780. He was captured by the Spanish in Mobile, held in a prison, and, after being paroled, reduced to begging. There is no evidence that he ever entered the Creek nation again and he left for England in 1782. That Sehoy took a new husband before Taitt’s departure is not unreasonable. And some of Wright’s research falls short. He states that Taitt disappeared from the record in 1793 when he was seeking reimbursement in London for the failed raid of ’79; however, according to Edward Cashin, Taitt was compensated with land in Nova Scotia and was the provost marshal in New Breton by 1784. His talent for surveying was again put to good use by laying out the streets for Sydney. Taitt is buried in Halifax. Michelle Woodham, a researcher of the Tate-Tunstall families, recently found the 1796 baptismal record for Alexander McGillivray, Jr. and David Tate at All-Hallows-by-the-Tower church, London. (Wright does track Alex Jr. to London and accounts for his death there.) The latter’s father is reported as “David Tate.” Here is the proof that was lacking for Wright. The informant had to be the teen-aged David himself. So Col. John Tate was an alter ego. As with the story of Capt. Jean Marchand, the husband of another Sehoy, “[i]t makes better reading if the brave father is killed instead of deserting his family when his tour of duty is over.” Wright, 187. The lesson for the genealogist is clear: never take anything for granted. Wright is a trove of information that merits further attention and refinement. This entry was posted in Antebellum Family Research, Creek Indians, Genealogy, Mississippi Territory, Tensaw Country and tagged Alexander McGillivray, David Taite, David Tate, J. D. Driesbach, Lachlan Lia McGillivray, Panton Leslie Company, William Weatherford. Bookmark the permalink.